Lofting or bunking your bed can maximize the space in your room. To ensure your safety, we have provided instructions on how to loft or bunk your bed. This requires 2 people to complete both correctly and safely. If you are not able to find a partner or are not comfortable assembling your bed, please contact the Operations Center at (860) 486-3113 or use UConn’s myUConn app to enter a work order. Note that due to large volume of work orders during move-in time, the request may take up to three business days. You will need bed ends, a stabilizer bar, a bedspring(s), and bunking pins. 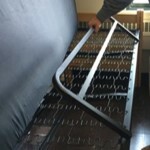 All necessary pieces for bed frames are provided in most areas of campus (but not all areas). In accordance with the housing contract, please remember that University furniture must remain in your room. Safety Rails are available by request. 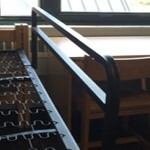 Please contact the Operations Center at (860) 486-3113 to request a safety rail for you bed. 1. Make sure you have (1) safety rail, (2) U-bolts, and (4) Wingnuts. Picture shows (1) U-bolt and (2) Wingnuts. You will need two of these setups to complete the installation. 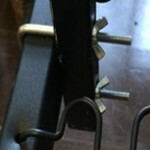 Remove the wingnuts and U-bolts from the safety rail. 2. Pull the mattress off the bed frame. Line up the safety rail on the inside of the bed frame so that the holes on the safety rail are above and below the bed frame outer rail. 3. 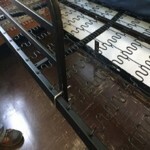 Insert U-bolt(s) around the bed frame and through the safety rail. Tighten wingnuts. 1. Make sure you have (1) safety rail. 2. Pull the mattress off the bed frame. Facing the frame hold the safety rail so that the welded clips are towards the bed frame. 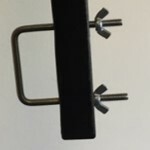 Tilt the safety rail at a 45 degree angle to slide the clip under the inside of the bed frame. 3. 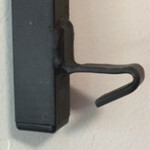 Pull safety rail back toward you once the clips are hooked on to the bed frame.